Let’s go for something different now. As usual, the winner should supply long-lat, together with a description of the geological features from this image. Posted We. 2nd of July, 10:34 Cape Town time (GMT +2). PS- For interest’s sake, would you mind commenting on your reasonning ? Reasoning ? 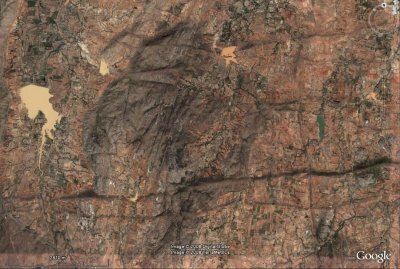 OK, here are some "secrets" : bare old relief with long dykes + clues of northern hemisphere location + poor vegetation + crowded survival agriculture + muddy lakes = cratonic India. BTW, although I knew that you are a craton expert, I didn’t try to trace your WoGE based on your personal profile :-) But funny enough, when tightening my research on the Dharwar Craton, your homepage popped up among the first hits. Anyway, it was a really enjoiable challenge, I fall for nicely exposed cratonic structures. ...and here comes WoGE #137. Have fun !